If you little princesses in your house, were you able to catch the "I Am A Princess" special event on Disney a few weekends back? They aired some great princess movies, including Tangled and the Princess and the Frog. After seeing the previews on television, Savannah had me add it to the calendar, and we made a point to tune in throughout the weekend to watch this special. In addition to the wonderful Disney princess movies, Francesca Capaldi, G. Hannelius Skai Jackson, and China Anne McClain, who played host for the weekend special shared with viewers what it means to be a princess. While watching the movies with the girls was fun, the best part of the whole weekend, was Savannah teaching her little sister how to say, "I am a Princess." And, on Sunday night, after watching Tangled on DVD for the umpteenth time, they danced around the living room in their princess dresses, singing "I am a Princess." It was one of the cutest things to see, as Savannah took Arabella's hand and they danced around. And, when Bella slipped during a turn, Savannah helped her up and said, "Try again, you can do it!." And, Bella did just that, this time spinning around and staying on her feet. Not only was Bella proud of herself, but Savannah gave her a great big hug and said, "See, you can do anything...you are a princess!" Ahh, my heart melted as I heard the girls talking to one another. A few days after the "I Am A Princess" weekend special aired on the Disney Channel, we received a surprise in the mail. Thanks to the folks at Disney, they sent Savannah and Arabella each a doll from the new Disney Princess and Me Dolls Collection. You should have saw their eyes light up as I took the Ariel and Rapunzel Disney Princess and Me Dolls out of the box. "Adventurous and bold, Ariel loves to explore new places and collect secret treasures. But most of all, she loves having a friend like you. Whether you're styling Ariel’s beautiful red hair, singing together to your favorite melody, or sharing secrets at bedtime, Ariel will always make you smile. Because that's what best friends do! 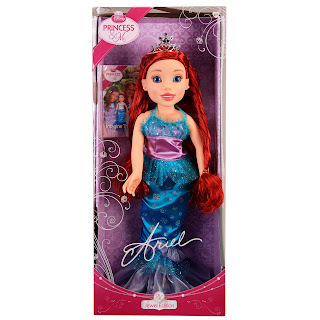 Disney Princess & Me dolls let you live a royal lifestyle with your favorite princess! Ariel has long silky hair, bright sparkling eyes and the official Disney Princess & Me trust mark on her foot. She is dressed in a beautiful gown in her iconic color, is fully posable and is wearing her signature tiara and a pair of dainty satin shoes." "Beautiful and determined Rapunzel loves reading, painting and exploring the world beyond the tower walls. But most of all, she loves having a best friend like you! Whether you're stargazing, playing with your favorite pet or going on fun adventures, Rapunzel is always ready to come along for some fun. Because that's what best friends do! 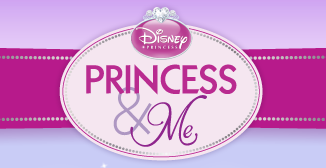 Disney Princess & Me dolls let you live a royal lifestyle with your favorite princess! Rapunzel has long silky hair, bright sparkling eyes and the official Disney Princess & Me trust mark on her foot. She is dressed in a beautiful gown in her iconic color, is fully posable and is wearing her signature tiara and a pair of dainty satin shoes." Savannah was most impressed, as it was almost her size. Bella get letting out "ohhhs and ahhhs" and couldn't wait to feel the sparkly dress. While Savannah is more the tom boy in the house, Bella is the girly girl and loves dolls and all things sparkly. So, I knew that she would go crazy when she saw the Disney Princess and Me Dolls. Savannah is just now getting into playing with dolls, as Bella is getting older can do more imaginative play with her. After taking the Disney Princess and Me Dolls out of the box, the girls quickly scooped them up and brought them over to their play mat in the corner of the living room. And, for the next hour, they sat their comparing dolls, brushing their hair and singing songs from the "Little Mermaid" and "Tangled" movies. 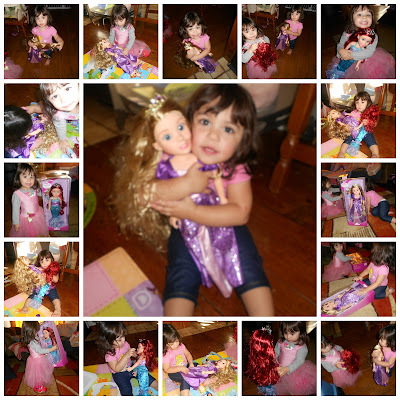 When it came time for bedtime that night, both girls made a point to bring their Ariel and Rapunzel dolls with them. Since receiving earlier in the day, Ariel and Rapunzel went everywhere with them, including needing a seat next to them at the dining room table. As I cuddled up next the girls in bed, I read them and their new Disney Princess and Me Dolls bedtime stories until they fell asleep. The next day, and every day since, the girls continue to play with their Disney Princess and Me Ariel and Rapunzel dolls. They even bring them along for car rides and trips to Nana and Papa's house. Last weekend when we went pumpkin picking, Ariel and Rapunzel tagged along. Who knew that these two 18" inch dolls from the new Disney Princess and Me Doll Collection would get so much playtime. But, I guess being princesses, my girls can't get enough interacting and playing with other princesses...even if they are dolls. In addition to the Ariel and Rapunzel Disney Princess and Me Dolls, you can also purchase Belle, Tiana, Aurora, Cinderella and even Merida from Target and Toys 'R' Us. Each doll retails for only $39.99...not a bad price for the amazing quality, including the attention to detail of their dresses. Your little princess will fall in love with the Disney Princess and Me Doll Collection, just like my girls have, once they set eyes on them. And, with the holidays right around the corner, the Disney Princess and Me Doll Collection would make a great gift to share with that special princess in your life. The new Disney Princess and Me Doll Collection, which includes popular Disney princesses like Rapunzel, Ariel, Belle, Cinderella, Tiana, Aurora and even Merida from Brave is now available at Target and Toys 'R' Us. Each product in the line is thoughtfully designed with the highest quality materials to give your princess a playing experience she will remember forever. Disney Princess & Me invites your little princess to play with her favorite Disney Princess as her Best Princess Friend (BPF). The beautifully sculpted 18” dolls are dressed in meticulously-crafted ball gowns inspired by their iconic gowns from the beloved films.